to 25.4 cu.ft. when they're lowered. and colour combinations - for a cool and clever finishing touch. The 1.6L Ti-VCT I-4 engine is standard in S and SE, and is engineered for responsive performance with its 120 horsepower and 112 lb.-ft. of torque. 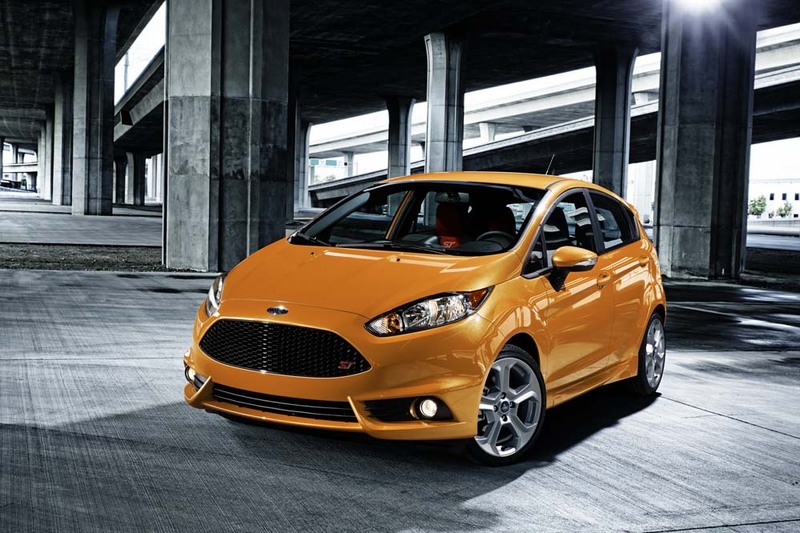 And the 1.6L ecoBoost engine in the ST churns out a pin-you-in-your-seat 197 horsepower and 202 lb.-ft. of torque. Fiesta ST packs and turbocharged and direct-injected 197-hp 1.6L EcoBoost engine mated to a slick-shifting 6-speed manual transmission. And agile handling, too, compliments of unique ST sport-tuned suspension components, and standard Torque Vectoring Control technology, which helps manage understeer on the corners. Starting at $16,763 the Ford Fiesta S comes with a standard 1.6L I-4 engine, cloth-trimmed bucket seats, a standard reverse camera, and Ford SYNC® with Bluetooth connectivity. Starting at $18,924 the Ford Fiesta SE gets upgraded 15-inch aluminum wheels with electronic temperature control, cruise control, power windows, heated mirrors, and heated seats. Starting at $26,458 the Ford Fiesta ST steps it up with the 1.6L EcoBoost® I-4 engine, 17-inch painted aluminum wheels, performance brakes, and dual chrome-tipped exhaust. On top of the ST aesthetic upgrades, additional standard features include push-start ignition, SYNC® 3 with SiriusXM® satellite radio, and RECARO® leather-trimmed front seats.